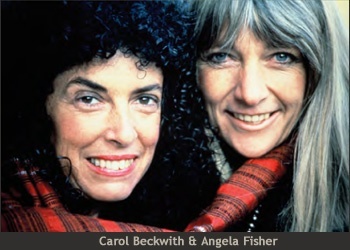 Forty years of work on the African continent have carried Carol Beckwith and Angela Fisher across 300,000 miles and through remote corners of 48 countries in exploration of more than 150 African cultures. In the process, this team of world-renowned photographers has produced sixteen widely acclaimed books and made four films about traditional Africa. They have been granted unprecedented access to African tribal rites and rituals and continue to be honored worldwide for their powerful photographs documenting the traditional ceremonies of cultures thousands of years old. As an intrepid team of explorers, they are committed to preserving sacred tribal ceremonies and African cultural traditions all too vulnerable to the trends of modernity. The Beckwith-Fisher images are the result of a long, enduring and deeply respectful relationship with African tribal peoples. This, combined with their photographic skills, creates an intimate portrayal of ceremonies long held secret that might have never been recorded. Their work preserves and presents the power, complexity and celebration found within the rituals of African tribal life. Aware that traditional cultures in Africa are fast disappearing, Carol and Angela have been working with an urgency to complete their ongoing study of African Ceremonies with the goal of covering the remaining traditional ceremonies in the 13 African cultures they had not documented. Their latest double volume book and traveling exhibition, “African Twilight: Vanishing Rituals and Ceremonies”, completes the journey begun in African Ceremonies, covering rituals and ceremonies from some of the most inaccessible corners of the continent. The traveling exhibition premiered at the Bowers Museum in 2018, and the culminating two volume book was released by Rizzoli, Autumn 2018. Honored twice with the Annisfield-Wolf Book Award in race relations for “outstanding contributions to the understanding of cultural diversity and prejudice,” Angela and Carol are also winners of the Royal Geographical Society of London’s Cherry Kearton Medal for their contribution to the photographic recording of African ethnography and ritual. The photographers have made four films about traditional Africa, including Way of the Wodaabe (1986), The Painter and the Fighter, and two programs for the Millennium Series Tribal Wisdom and the Modern World. Numerous exhibitions of their photography and films have been shown in museums and galleries around the world. In 2000 their Passages exhibition opened at the Brooklyn Museum of Art featuring 97 mural photographs, six video films and a selection of African masks, sculpture and jewelry. This exhibition has traveled to seven museums on three continents. "Carol Beckwith and Angela Fisher are not only truly remarkable photographers, but their dedication to preserving for all time the dazzling diversity of African ceremonies is unparalleled. Their celebration of Africa cultures will forever serve as the most compelling and passionate portrayal of the splendor of human creativity from the very continent that gave rise to all humanity."